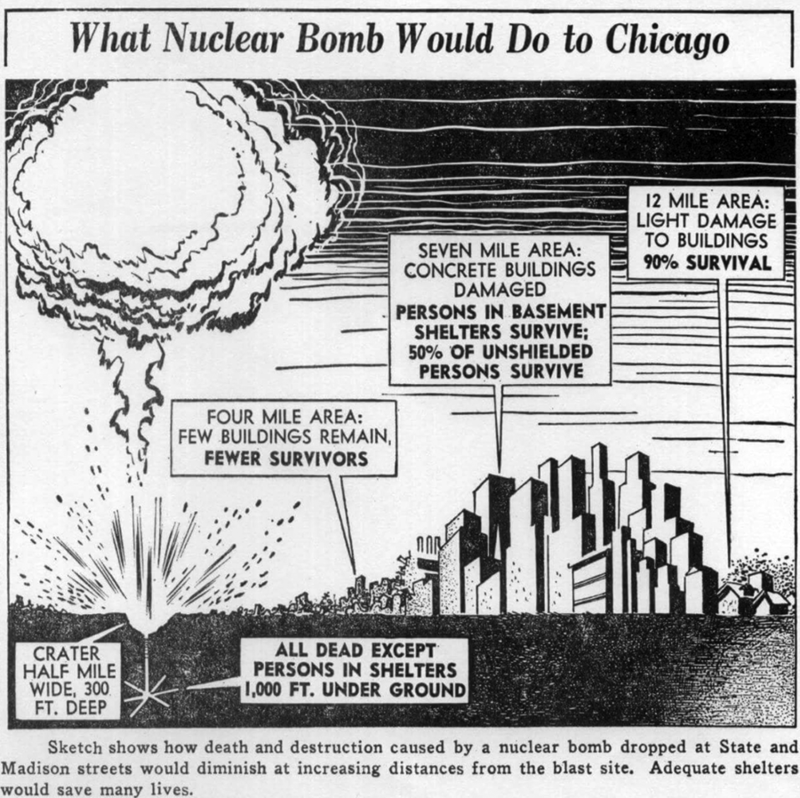 The Atomic Age was a time of great fear and tension. America was filled with relief after victory in WWII. We had "The Bomb." The Soviet Union, an uneasy Ally during WWII, also had nuclear weapons and would be seen as the Enemy. Text on OTRCAT.com ©2001-2015 OTRCAT INC All Rights Reserved-Reproduction is prohibited. Thanks to advances in broadcast technology developed in WWII and the growing sophistication of writers, producers, and audiences, Network and Syndicated radio was full of great programming--arguably some of the Golden Age's finest. Much of this programming both heightened or eased fears. Nuclear proliferation created a dual effect on the population as the public feared the annihilation of mankind and was fascinated with the possibilities of nuclear technology. We call this programming "Atomic Radio." Red Scare Radio: "Communists are Evil"
This sentiment has been perpetuated for generations. Some scholars make the argument that the Cold War actually began in 1917, with the rise of the revolutionary Bolshevik regime in Russia. After the end of WWII, the United States and the then USSR disagreed politically and the US actively worked to control and contain the spread of communism through economic, political, and militaristic efforts. Seen through this lens, the excesses of the House Un-American Activities Committee and Sen. Joseph McCarthy begin to be understandable and the nation was swept into anti-communist fervor. Partially, as an attempt to revive Hollywood's reputation after the blacklisting of the "Hollywood Ten", the entertainment industry produced an abundance of anti-communist propaganda projects. Although some of this work was low quality, but a good deal of it was well produced, quality entertainment. I Was A Communist for the F.B.I. was based on the career of Matt Cvetic. A mole in the American Communist Party, Cvetic feed information to the FBI. His life was in constant danger, and he was unable to tell even his family what his true mission was. 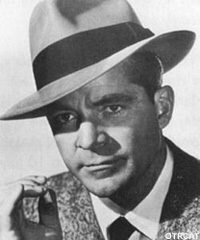 Dana Andrews played Cvetic on the radio from 1952-54. 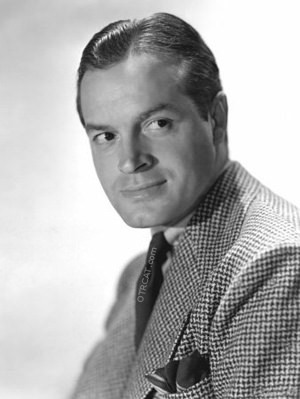 The program was a great example of the Radio Noir genre, with Andrews' tagline: "I walk alone." News programs are not always propaganda vehicles. Like some of today's Cable TV news outlets, they were driven by the political leanings of their producers, even in the beginning of the Atomic Age. 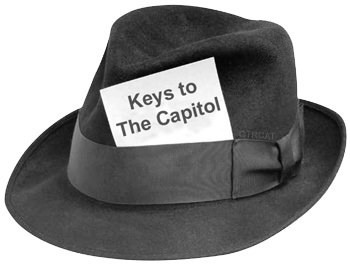 NBC's weekly news program, Keys to the Capitol presented commentary from Washington's leaders and insiders from 1954-56. Very interesting for our discussion is the Aug 11, 1954 broadcast entitled "American Attitude Towards Communism". 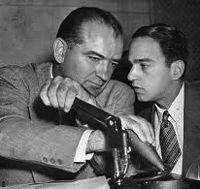 Of further interest are the broadcast speeches of Sen. Joseph McCarthy, recorded between 1950 and 1954. 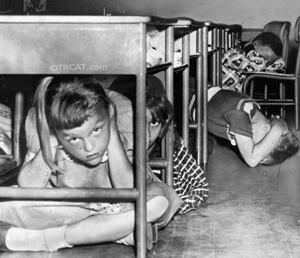 Duck and Cover Radio: What's the view like from under your school desk? It is easy to be glib nearly 60 years removed, but the terrors of The Bomb were and are very real. Radio did a great deal to explain why these fears were so real, and helped to feed the growing paranoia. Perhaps a more balanced accounting at the beginning of the Atomic Ageis the four-part documentary series The Quick and the Dead (1950). This balance was probably more due to circumstance than intent. Producer Fred Friendly was fearful and critical of the new technology, and hoped his documentary would help quiet calls for the US to use atomic weapons in Korea. However a big part of his team was William Laurence, the New York Times Science Correspondent whom the Army had selected to document the Manhattan Project. Laurence has been criticized for sanitizing and even glamorizing the realities of Atomic Warfare. Fred Friendly scripted the program as a conversation between an average taxpayer, played by Bob Hope, who wonders about the high portion of his tax dollars that were going to Atomic research, and Laurence. The conversation was "illustrated" with clips from the news room, historical dramatizations, and taped conversations with figures involved in the early atomic age. 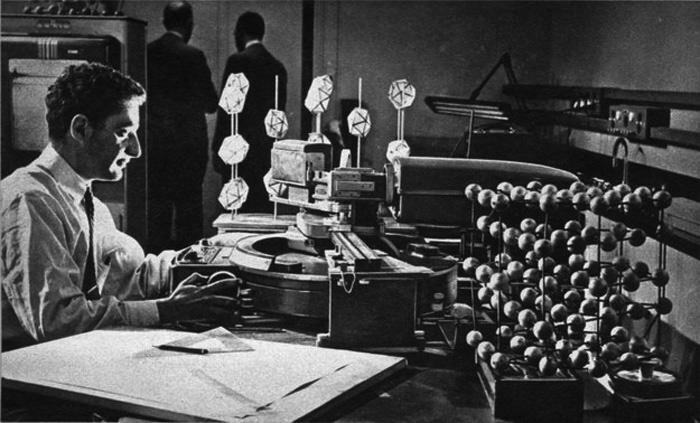 The series climaxed in the fourth episode, which covered the potential of Atomic energy, including the miracles of Atomic Medicine. For Further Listening Enjoyment, Try Living In an Atomic Age, One World Flight, and One Out of Seven. Fortunately, this isn't reality, it's radio. And we expect our Spy-Heroes to get in and out of danger, and hopefully get the girl along the way. Radio doesn't disappoint. A Cold-War story, I Was a Communist for the F.B.I. certainly fits well into the Crime as well as the Radio Noir sub-genre.The legacy of James Bond makes it a little difficult to take the world of espionage and spy-craft as seriously as it should be. In reality the work of our intelligence agencies was of great value the nation during the Cold War. The greatest of these contributions may remain a mystery; a spy who gets well known is often a spy who gets dead. 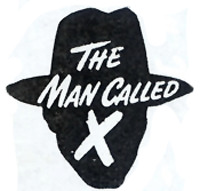 Ken Thurston, played by English actor Herbert Marshall, was The Man Called X, a globe-trotting agent of "The Bureau." Along with his comic side kick Pegon Zellschmidt, he got his start in the summer of 1944, chasing Nazis. In the post war years there was plenty to keep him busy with relief-organization profiteers, black marketers, smugglers and nuclear materials thieves. "The Bureau" that Thurston worked for is never really defined, but it is the Bureau's Chief that sends Thurston on his world wide jaunts. For an agent in the 40s and 50s, Ken Thurston made it to many corners of the world, from Manhattan to Korea, Maine to Baja California, Japan to Tierra del Fuego. His companion, Pegon Zellschmidt, may or may not accompany him on his journey, but he always manages to show up, often to visit a nearby "Cousin." The Office of Strategic Services (OSS) was the predecessor to the CIA. Although the stories are about agents adventures in WWII, the program is clearly aimed at a cold war audience. The Cloak and Dagger program asks the question "Are you willing to undertake a dangerous mission for the United States, knowing in advance you may never return alive?" With the patriotism of the War Years still fresh, and post war prosperity beginning to boom, who would have said no? In the tales related in the program, the heroes did return alive, if only by the skin of their teeth, and sometimes even after getting the girl. For Further Listening Enjoyment, Try David Harding, Counter-Spy, Dangerous Assignment, The Adventures of Frank Race, and The Silent Men. Sci Fi had an impact in radio drama. 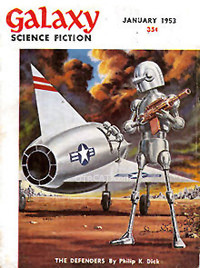 There were many science fiction anthology series during the 1950's, including 2000 PLUS, Dimension X, and X Minus One. Escape and Suspense featured a number of Sci Fi episodes. Many of the stories used were taken from pulp Sci Fi magazines, featuring the best Sci Fi authors of the time.The early Cold War years were full of contradictions. It was a time of great prosperity, but also a time of growing fear. Advances in rocketry brought the dream of space flight in reach, but also brought about the ICBM (intercontinental ballistic missile). Science Fiction had entered its Golden Age, but was still largely discounted as pulp fiction. Apocalyptic and Post-apocalyptic stories have long been a part of Science Fiction. Sci Fi authors from both the Left and Right political spectrum used the Aesopian potential of Science Fiction. Radio Dramas, from a modern perspective, don't seem as "over the top" as the B grade Sci Fi movies of the time, and are a good way to enjoy some of the best Science Fiction has to offer. The X Minus One program partnered with "Astounding Science Fiction" Magazine, and later "Galaxy Science Fiction" Magazine -- both respected publishers of serious SciFi. In "The Castaways", the Military is conducting tests of a new Atomic Bomb on a remote Pacific Atoll. The General in charge of the test is a no-nonsense Officer who will let nothing stand in the way, and his lead scientists are in awe of the device they have created. But of course there is a snag, the natives of the island are unwilling to leave for the test. In protest they all leap into the sea from a high cliff, after putting a curse on the test and its commander. The test fails, but for surprising reasons. Ray Bradbury stories are featured in the radio dramas "There Will Be Soft Rains", and "Zero Hour." In "Zero Hour," children all over the world playing a new game, Invasion. Of course it is just child's play, and parents pay little attention. But they don't realize the game is directed by an Alien force, not unlike those insidious Reds, for whom Invasion is more than a game. "Soft Rains" tells of a wondrous automated house. In the morning the kitchen automatically makes breakfast while the beds make themselves, later a team of mechanical mice clean and remove all the dust, before bedtime beds warm themselves, and the entertainment system will read the occupants a favorite poem. Only there is no one to read too, the family that bought the house has been vaporized in an atomic war. But the house doesn't know that. Atomic War has been raging for years on the surface, while the citizens are hiding in underground tunnels, protected by robots. But what are the robots protecting from? One of the human scientists has fallen in love with a captured Asiatic enemy, a crime punishable by banishment to the deadly surface. But the robots have hidden the fact that there is no war. Nukes & Commies Bundle 1940s-1960s GIANT Compilation of 31 different volumes of Atomic era recordings and Cold War recordings! Nukes, Red scare, News, Conelrad, Civil Defense, and more! Duck and Cover, Plagues, Robot Attacks, Time Travel, Annihilation, Speeches, and more! 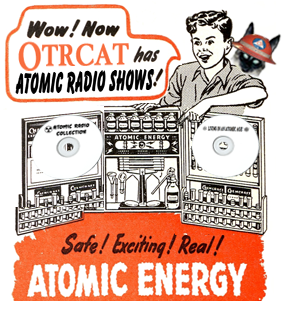 Atomic Radio Collection 1940s-1959 Compilation of episodes from all various series of "Atomic" themes Duck and Cover , Spy v Spy, Speeches, and more! Commies and Cold War in Old Time Radio 1940s-1960s Compilation of episodes and news broadcasts of the day portraying "the threat of communists in America and abroad" The Red Scare! Be the first to comment on "Atomic Radio and the Cold War Radio"